Thank you to everyone who has applied for a scholarship. The application window for 2018 has ended. We have passed the $1.3 Million Mark! Congratulations, Ladies! ISA provides scholarship assistance for women whose goal is to become an airline pilot. This scholarship assistance has taken the form of ratings, type ratings, and other career assistance. Finalists for the ISA Airline Scholarship will be interviewed at the annual Women in Aviation conference. If unable to attend, interviews will be arranged prior to the conference in your hometown or domicile. Please read and follow application instructions carefully. Scholarship applications must be signed and postmarked by November 12, 2019. Contact Scholarship Coordinator Donna Wallace by email or call 937-839-4647 with any additional questions. Or Karen Guadagni with questions specific to ISA+21. Remember, it is ISA+21 providing the scholarship, not Women in Aviation. Applicants must be a member of Women in Aviation International by November 1, 2019. Winners will be notified after the WAI conference at Orlando, Florida March 5 - 7, 2020. 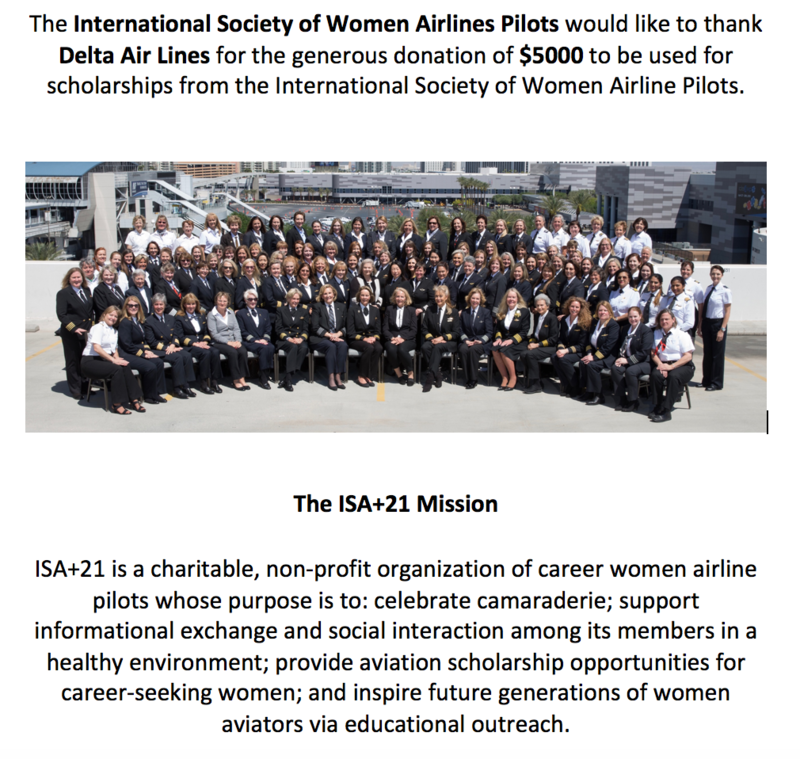 The International Society of Women Airline Pilots (ISA+21) offers scholarships to promote the advancement of women in the world’s airline flight decks. ISA+21 will award two B737 or A320 type ratings valued at $10,000 each. The successful candidates will train for eight days with Flight Training International in Miami. Funds will be paid directly to the flight school and training must be completed within 18 months. One letter of recommendation must be from a pilot who has flown with you. Applicants must have an ATP, a minimum of 3000 hours total time including at least 500 multi-engine turbine, and a current first class medical certificate. Candidates should provide details pertinent to letters of inquiry from the FAA regarding any aircraft incidents or accidents. We require a list of all FAA check rides and their outcomes. Finalists will be interviewed at the annual Women in Aviation conference. The recipient is responsible for all travel, housing, and personal expenses during training. Hotel reservation assistance is available. Winners will be notified after the Women in Aviation conference. Only one Financial and one Type Rating Award is allowed in a lifetime. Applicants may apply as many times as they wish. Applicants must join Women in Aviation wai.org by November 1, 2019 to apply. ISA+21 members are welcome to apply. Tips and Information on winning a scholarship can be found under our Public Documents section. The International Society of Women Airline Pilots (ISA+21) offers scholarships to promote the advancement of women in the world’s airline flight decks. ISA+21 will award three scholarships up to $5000 to women working to acquire a CFI, CFII or MEI certificate and up to $5000 for the David Mandot Memoriam CFI/CFII scholarship. Funds will be paid directly to the American Flyers Academy at their Addison TX, Pompano Beach, FL, or Morristown, NJ locations, an accredited college or university with an aviation curriculum, an aviation technical school, or government approved flight school. Training must be completed within one year of the award. One letter of recommendation must be from a pilot who has flown with you. Your resume should include all schools attended and degrees acquired. Candidates should list academic honors, scholarships, awards, leaderships, volunteerism, and special achievements. Applicants must be a woman with a current FAA medical. The appropriate written exams must be completed with a passing grade before scholarship dispersal. Candidates should provide details pertinent to any letters of inquiry from the FAA regarding any aircraft incidents and a list of all FAA check rides and their outcomes. Please include in your essay stating why you are in financial, as well as career, need of our scholarship. Applicants do not have to belong to ISA or WAI to apply for the financial scholarship. Our winners' goals must include: Desire to be an airline pilot. Pay attention to the "Violations" section. State NONE if you do not have any—or clarify if you do! Remember, we are ISA+21, a group of women airline pilots, giving these scholarships... not WAI, a particular airline, or any other entity. Our members can see more detailed information about the women who have been awarded over the years and where they are now.